The very best that ever was. Genius of the arts. A lightning storm of comic genius. Ferociously funny. He was one of a kind. Social media exploded with such epithets as news of the passing of Robin Williams spread wide one year ago. The comedy legend died by suicide on August 11 at his home in Northern California. He was 63. Whenever you first experienced the brilliance that was Williams – be it via his frenetic stand-up comedy routines or his shape-shifting on-screen performances – a new dynamic was suddenly added to how you viewed the popular culture. He burst into our lives with a relentless enthusiasm to provoke laughter. Watching Williams was a sight to behold, as if his infectious mirth could barely be contained in corporeal form let alone the two-dimensional constraints of television or cinema. 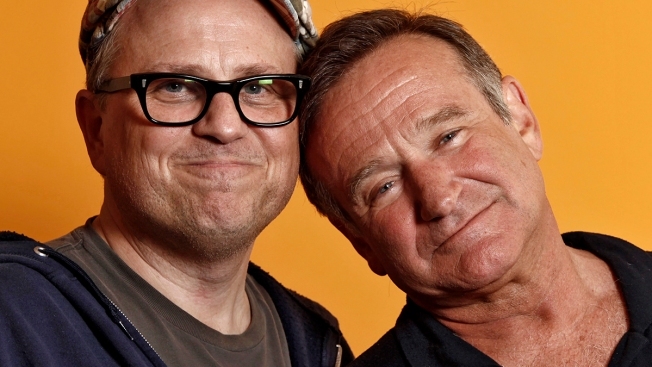 But it was there, on-screen where the majority of us were introduced to and came to love Williams: As Mork from the planet Ork, radio disc-jockey Adrian Cronauer, educators John Keating and Sean Maguire, housekeeper Euphegenia Doubtfire, and choreographer and club owner Armand Goldman. Entertainment weekly dubbed Williams "the funniest man alive" in 1997, an appropriate title for a performer at the time riding a wave of broad popularity thanks to star turns in "Mrs. Doubtfire," "Aladdin," "Hook," "Jumanji," "The Birdcage," "Flubber," and "Good Will Hunting." For almost four decades he touched the lives of generations across the globe. He made us laugh, and he often made us cry though laughter. Williams became a Hollywood player thanks to a spin-off character of the then-popular "Happy Days." Mork from Ork was a fish out of water alien trying to exist among the baffling humans of Earth. "Mork & Mindy" aired from 1978 to 1982, buoyed by the contrast between Williams' rapid fire free-associations as Mork and the down to earth practicalities of Mindy, played by Pam Dawber. As airman Adrian Cronauer assigned to the U.S. Armed Services Radio station in Vietnam, Williams embodies a cheeky, rule-breaking deejay whose penchant for telling the truth and playing non-government-approved music endears him to soldiers tuning in. It was this 1987 Oscar-nominated role that first showed audiences that in his quiet moments, Williams could be just as powerful as when making us laugh out loud. Another Oscar-nominated role, this time as provocative and inspirational English teacher John Keating, whose students come to love poetry, and yes, seize the day. Set in a tony education academy in Vermont in 1959, Williams' Keating taught not only the joy of Walt Whitman, but also the pleasure of free-thinking and self-determination. At the film's release in 1989, The Washington Post praised Williams for giving a "nicely restrained acting performance." What better way to showcase Williams’ comedic skills than to cast him as a hapless divorced father who takes on the role of a tweedy Scottish nanny in order to be closer to his children. Released in 1993 it became a blockbuster hit that has grossed almost half a billion dollars at the worldwide box office, and delivered comedic gems including "Helloooo, dear," "My first day as a woman and I'm getting hot flashes," "Carpe dentum. Seize the teeth," and "It was a run-by fruiting!" In this light, fluffy 1996 Hollywood remake of the French-Italian film "La Cage aux Folles" Williams plays Armand Goldman, a gay cabaret owner who, with his locally famous drag queen life partner (Nathan Lane) agree to put up a false straight front so that Goldman's son can introduce them to his fiancée's right-wing moralistic parents (Gene Hackman and Dianne Weist). When released, the Gay & Lesbian Alliance Against Defamation (GLAAD) praised the film for "going beyond the stereotypes to see the characters' depth and humanity." Williams' critically lauded role as psychology professor Dr. Sean Maguire earned him a best supporting actor Academy Award and helped solidify his standing as a dramatic actor of note. Taking on the genius but troubled young patient Will Hunting (Matt Damon) as a favor to his former college roommate, Maguire manages to help the youth open up about past and current misgivings by offering up his own personal anecdotes and life stories. It was Williams' fourth Oscar nomination and only win. "Thank you. Oh man, this might be the one time I’m speechless," Williams said as he took the podium to accept the award during the 1998 ceremony. He went on to thank co-stars Damon and Ben Affleck, director Gus Van Sant, the city of Boston and his then-wife Marsha, before adding, "And most of all, I want to thank my father, up there — the man who, when I said I wanted to be an actor, he said, 'Wonderful, just have a backup profession like welding.' Thank you. God bless you."